Item Description: Envelope (ca. 1860s?) 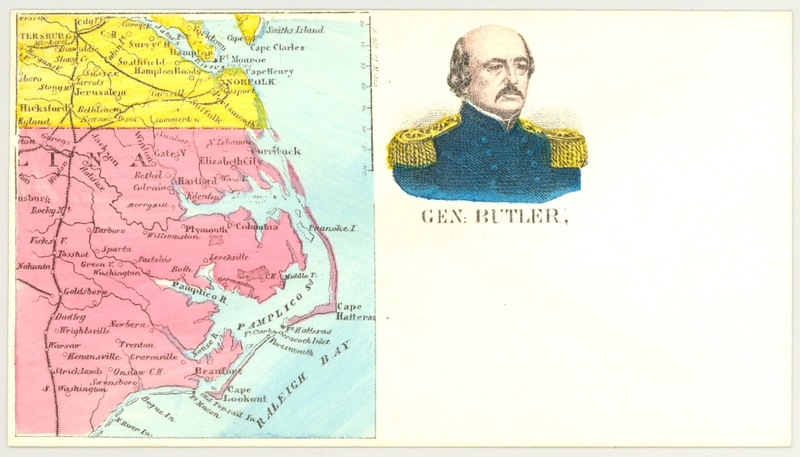 showing a map of eastern North Carolina and southeastern Virginia, and a portrait of General Benjamin F. Butler, U. S. Army. On November 10, 1863, General Butler assumed command of the Department of Virginia and North Carolina upon his arrival at Fort Monroe, Virginia. Item Citation: “Map of eastern North Carolina and southeastern Virginia, and portrait of Gen. Butler,” found in [Envelopes]. [S.l. : s.n., 186-?-18–?]. North Carolina Collection, Wilson Library, University of North Carolina at Chapel Hill. This entry was posted in North Carolina Collection and tagged envelopes, Fort Monroe, General Benjamin Franklin Butler, maps, North Carolina, pictorial envelopes, Virginia. Bookmark the permalink.